Every year hordes of visitors descend on the tiny Costa Rican town of La Fortuna. They come for one reason and one reason alone—to experience the majesty of Costa Rica's most famous active volcano and its surrounding natural wonders. Here is our expert guide to discovering Arenal. La Fortuna is a town of just 15,000 people located north of Costa Rica's capital of San José, in the central lowlands. Yet some 1.5 million people visit it every year. That means this little hamlet is perpetually bursting at the seams with visitors eager to witness the most famous volcano in a country with no shortage of volcanoes. 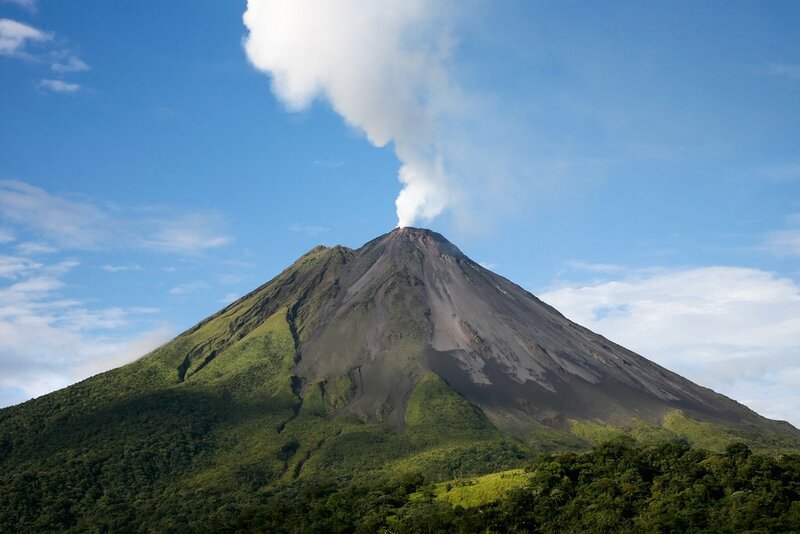 So why is Arenal volcan number one? For starters, it's considered one of Costa Rica's most active volcanos, although it's been a while since this 5,673-foot-high beast really lost its temper. The last major eruption occurred in 1968, but it was a big one. Three giant craters erupted on the west side of the volcano, spewing toxic gases and lava that decimated the towns of Tabacón and Pueblo Nuevo, claiming 87 lives in the process. Folks needn't worry, though. Arenal has seen little activity in the intervening 50 years, although it still puts on a show. During the day visitors are treated to smoke billowing from the peak while at night basaltic lava streams down from an active vent on the western side. What newbies may not know is that Arenal isn't the only volcano in the area. The smaller Chato Volcano is 3,740 feet high and lies just a few meters southeast of Arenal, close to the stunning La Fortuna Waterfall. Chato has been dormant for 3,500 years but it does contain a massive crater that has formed an idyllic green lagoon. There are a number of short trails that lead around the volcanos, affording views of lava eruptions. And you can rest assured that the park rangers here are diligent in maintaining safety standards. There are limits to how close visitors can get to Arenal, and if any volcanic activity threatens the area in the slightest, they don't hesitate to close the trails. Looking for more info on Costa Rican volcanos? Read more about the country's five best. When planning your Arenal adventure, it's important to understand the logistics of the location as well as the many sights and activities outside of La Fortuna. That's because the volcanoes are just one highlight. 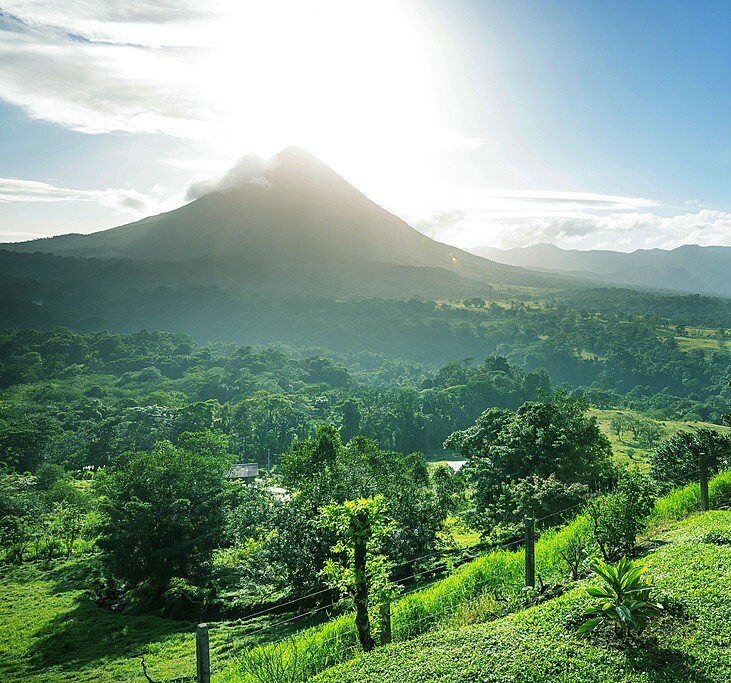 First-timers here may not know that La Fortuna and Arenal are located in the 29,692-acre Arenal Volcano National Park, which itself is part of the massive 504,094-acre Arenal Conservation Area. Within these thousands of acres are a wealth of biological and geologic wonders. It makes the options for trips and excursions near limitless. So as far as packing is concerned, come prepared for all eventualities. As a general rule, you'll want to be outfitted with a wide variety of outdoor clothing functional for both rugged terrain and casual activities. For trekking and excursions, bring a backpack (ideally waterproof), hiking boots, hat, water bottle, mosquito repellent, durable sunglasses, and sunscreen. For less strenuous activities, T-shirts, shorts, and flip-flops are the order of the day. Know that even if you arrive in Costa Rica's dry season, rain can still occur. Also, depending on your itinerary, you may be swimming among waterfalls. Pack a bathing suit as well as a rain jacket and waterproof storage packs. If you who want a good chance at unobstructed views of Arenal's peak, you should avoid Costa Rica's rainy season (May to early November). During this time the top of Arenal is almost perpetually shrouded in cloudy mist. That said, even during the dry season (mid-November to April) the peak is often obscured under a bit of cloud cover, so it's a crapshoot. 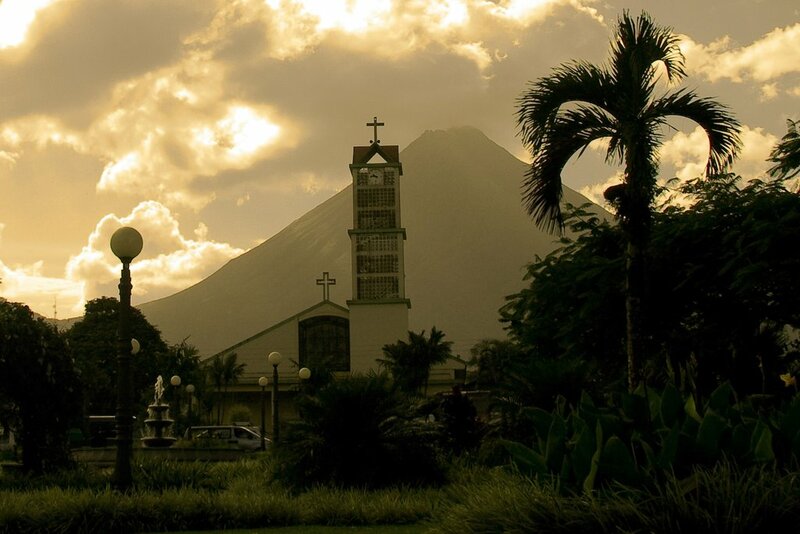 Locals, in fact, estimate that there are only about 60 days per calendar year that affords a clear view of Arenal. As mentioned above, La Fortuna is situated in Costa Rica's northern lowlands. The town's official altitude is 882 feet, which puts it close enough to sea level that you needn't worry about any forms of altitude sickness. Of course, Arenal itself is thousands of feet high, but it's prohibited to ascend the volcano. Visitors are allowed only so far as Arenal's base, at which point it becomes a high-risk zone. There are a number of short hiking trails that run along the perimeter, and we've listed them below. Most tourists and travelers choose to visit Arenal during Costa Rica's dry season, as it affords better photos of the surrounding nature. These are the hotter months, but even so, temperatures year round typically don't vary much. They range between the low 70s (often at night) to the low and mid-80s (during the day). La Fortuna gets between 10 and 15 feet of rain per year. If you're interested in river rafting (more on this below), you may want to come during the rainy season, when rivers are at their highest point. But, again, Arenal is likely to be more obstructed by clouds during this time. Having said that, weather conditions here can change at the drop of a hat, regardless of the season. It's not uncommon for Arenal to be hidden in cloud cover one moment, only to have clear skies the next. So cross your fingers, stay alert, and keep that camera at the ready in the event you hit the photographic jackpot. La Fortuna is easily accessible from San José. Here are some of the most popular transport options. You can take a public bus, which leaves from Ave. 7-9 at Calle 12 and takes around four hours to arrive. If you want something more intimate than a public bus you can opt for a shuttle, which costs a bit more but holds fewer passengers (around six people). if you're in a rental car, simply travel west on Highway 1 and turn north on Highway 703 at the town of San Ramon. The travel time from San José to San Ramon can take up to an hour and a half. From there it's another two hours or so north to La Fortuna. All told, it should take about three and a half hours to reach La Fortuna from San José. By air, local carrier Sansa offers daily afternoon flights from San José to La Fortuna. The journey takes 30 minutes. Once in La Fortuna you can get around merely by walking. As for making the trip to Arenal, the town is teeming with travel agents and tour operators, all of whom will happily book your 20-minute ride from La Fortuna to the entrance of the National Park. That said, we recommend booking a tour beforehand with one of our expert operators, as not all vendors in town are licensed and/or honest. If you're traveling without a rental car, you're going to want to stay in the downtown area of La Fortuna. That's where you'll find the highest concentration of restaurants and hotels. There's a wide variety of great eating in the center, from cheap casados (set lunches) at humble family-run restaurants, to pizzerias, sushi, and even gourmet fusion cuisine. For fine dining in an intimate environment, head to Restaurante Don Rufino; for dessert with the kids head to the Rain Forest Cafe. Vegetarians would do well to try Organico Fortuna. Lodging options in La Fortuna run the gamut from backpacker hostels to five-star luxury resorts. Many of the more upscale options are located just outside of town, on the road to Arenal Volcano, so it helps to have a rental car. One solid mid-range option in town is the Hotel Monte Real. It has spacious rooms with modern conveniences like air conditioning, and there's a pool as well. The best part is that it's located just outside the center. That means it's quieter than many other central options. 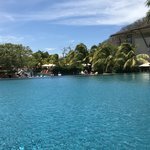 And if you really want to splurge, you can choose to stay outside of town in one of the most famous hotels in the area: the Tabacon Thermal Resort & Spa. This luxury resort sits right on the Tabacon Hot Springs (more on these below), and features a number of restaurants, all modern conveniences, and luxury spa treatments among other amenities and services. And of course, access to the hot springs is free for guests. Arenal is one of those great destinations because you could spend a week in the town of La Fortuna and still not run out of fun excursions or other things to do in the area. Here are the best ways to spend an afternoon, or even multiple days. One of the most popular activities in the park is hiking the trails around Arenal. These are well maintained and make for short and easy walks. One popular trail, the Sendero Colada 1968, is just over two miles long. Even shorter is the Tucanes hiking trail, which is only about 1.3 miles long. None of the trails ascend very high (as mentioned, it's prohibited to get too near the volcano) but they do pass along some forest and dried lava fields. Sendero Las Coladas, for example, is a popular trail (also about 1.3 miles) that passes by these lava rocks. At some clearings, it affords postcard-perfect views of Arenal. Sendero El Ceibo is an even shorter trail (about one mile) that leads to a majestic, 164-foot-high Ceiba tree. One of the most popular excursions from La Fortuna is to visit the geothermal hot springs. These thermal pools formed after the 1968 eruption and are still fed by the Tabacon River today. There are a number of springs in the area, and each has different features. Some offer both cold and hot pools, while others are on the upscale end and feature waterslides and swim-up bars. The entrance fees do vary, but not to worry—there are hot springs here to suit all budgets. One of the most popular hot springs in the area is Tabacon, which has lush, manicured gardens and is all natural (meaning it doesn't use pumps or heating systems). Others include Baldi (an inexpensive option popular with kids), Ecotermales (which is quieter and great for couples), and Paradise, another solid budget option. We recommend indulging in your hot springs excursion after hiking around Arenal—as soaking in the warm pools is a great end to a rigorous day. 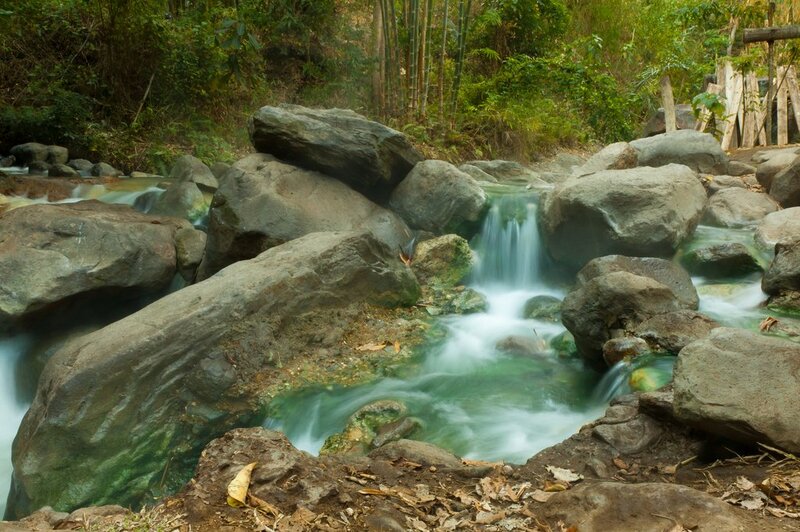 For more on this subject, check out our list of Costa Rica's best hot springs. 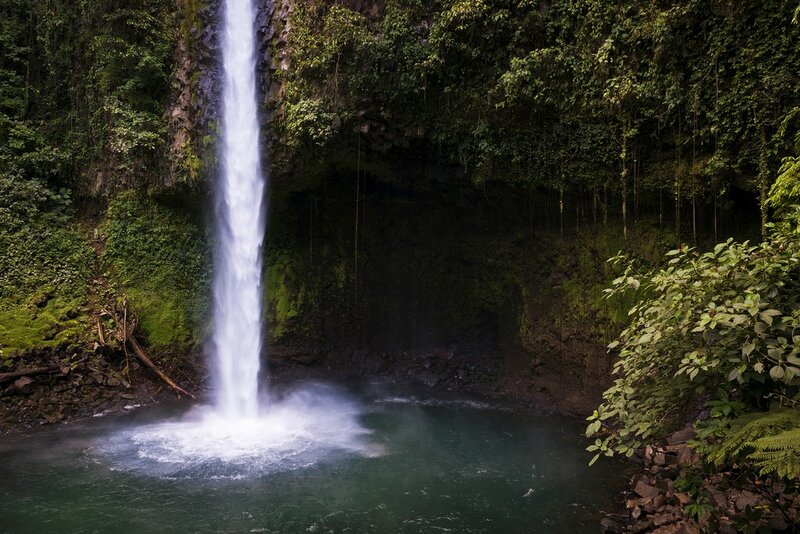 The most iconic landmark near La Fortuna (aside from Arenal Volcano, of course), has to be the La Fortuna Waterfall. It's a must-visit for any traveler, and, best of all it's located a mere 15 minutes south of town. It's a popular destination (indeed, some say it's the most visited waterfall in the country) and we can see why. The majestic waterfall, fed by the Tenorio River, cascades 75 meters down into a deep blue lagoon that demands visitors take a dip. It's located at the base of the Chato Volcano and makes for a great half day trip. Taxis from town will make the trip to La Fortuna Waterfall for a small fee. Costa Rica has a bounty of beautiful cascadas to explore—keep reading about the best waterfall hikes in the country. 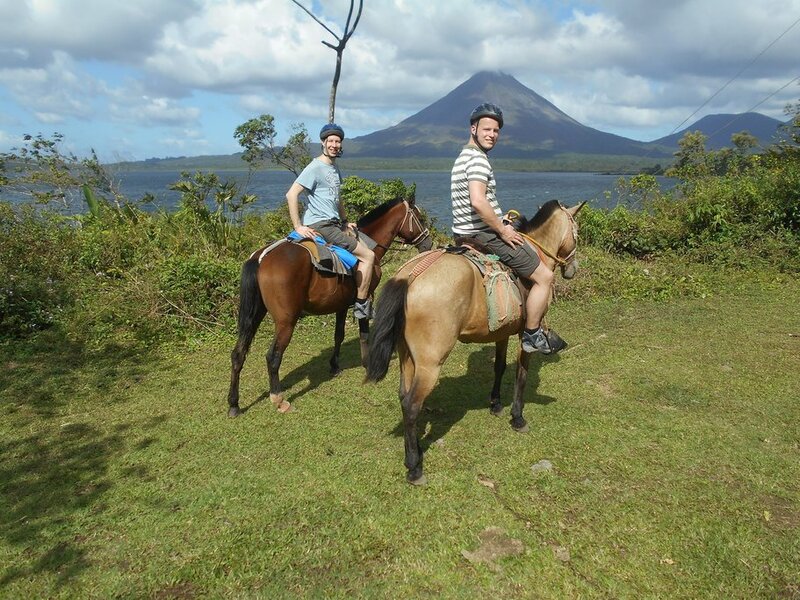 Horseback riding is a popular activity around La Fortuna and Arenal. There is no shortage of operators, and tours often last between two and six hours. Routes typically follow around Arenal and ride up to some breathtaking viewpoints of the volcano. Many tours also ride up to the perimeter of the "danger zone" at the base of the volcano. Some rides even go to the La Fortuna Waterfall. Experienced guides lead the horseback excursions and will point out interesting flora and fauna along the way. This is a popular activity for adrenaline junkies. There are a number of licensed operators in town, with most tours involving repelling down canyons in and around the La Fortuna Waterfall. But there are a number of waterfalls and canyons here. Guides will explain all the safety measures and provide you with helmets, harnesses and other safety equipment. Then it's time to rappel. The sights and sounds are incredible as you descend 200 feet (one of the longer descents) down the side of a canyon, along roaring waterfalls. Guides will ensure you go at the speed you prefer, and no prior experience is necessary. Nearby Penas Blancas River offers some safari rafting fun for the entire family. Here you can book a "safari float" tour that really is a gentle, floating tour down the Penas Blancas. Children of all ages can come along and guides will point out the myriad animals you're likely to see on the riverbanks, including monkeys, sloths, and even crocodiles. Interested in checking out the rapids during your trip? Here's a 5-day itinerary that combines a rafting adventure on the Pacuare River to an excursion in one of the country's top surf spots in Puerto Viejo.